Martin Zappa and his two brothers Tony and Giulio arrived in Australia from Italy in the late 1940's. They worked in the cane fields at Innisfail (North Queensland) for 10 years. During those years, in the cane off-season, they would travel to the Tenterfield Bonshaw district and worked as tobacco pickers. In the late 1950's Martin returned to Italy. There he married and returned to Australia in 1960 with wife Amelia and their first child. From 1960 to 1968 Martin and Amelia, Tony and Giulio settled down in the district west of Tenterfield (NSW). For these 8 years they share-farmed as tobacco growers. In 1968 their hard work earned them the pleasure of purchasing their first property. They named the property 'Saliet' the name originating from a small area in the Alps of Northern Italy. In 1972 they purchased the neighbouring farm called Newfarm. Newfarm and Saliet now combine as a 4000 acre property. Martin and Amelia have 4 sons and 1 daughter who are all married and played important roles in making Newfarm / Saliet a success. 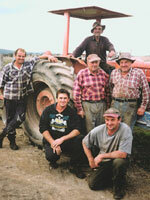 Today, with their 3 sons, Steven and wife Bianca, Adrian and wife Brenda, Peter and wife Samantha and their families, they are proud to own and operate a diverse range of enterprises such as running 120 head of cattle, 5000 head of superfine wool merino sheep, growing 450 acres of fresh produce and approximately 600 acres of cereal crops and now the introduction of a 50 acre vineyard. Some viticultural aspects of Dumaresq Valley Vineyard include: cold frosty winters, lengthy sunlight periods, warm growing seasons with cool fresh nights. Vines planted on a hillside with a northern exposure intercepting an abundance of sunlight. Soils consist of clay mingled with trap rock. All of this with carefully selected clone varieties enhances the quality of wine. Dumaresq Valley Vineyard's first vintage consists of Chardonnay 2001 and Shiraz 2001. Our range of vines are not only French origin but also of Italian and Spanish origin such as specially selected varieties of Barbera and Tempranillo (available in future vintages).